The "talk show" has become a ubiquitous feature of American and European television. The various examples have been frequently discussed by academic commentators, as well as journalists in an attempt to place them in a cultural setting. Ultimately, the conclusion is reached by both academics and non-academics that talk shows matter because they are a focus for considerable public debate and are crucial to the landscape of popular television. All the variations of talk shows, from chat shows to celebrity interviews, have key elements in common: They all feature groups of guests, not individual interviewees, and they all involve audience participation. The studio audience is not only visible, but is given the opportunity to comment and intervene. 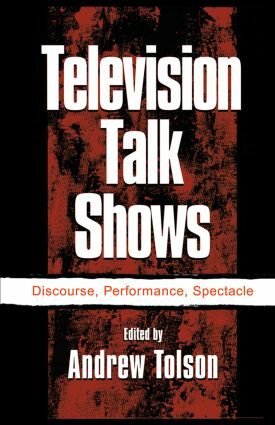 Other books have applied academic analysis to the phenomenon of these shows, but this is the first to analyze the actual "talk" of the talk shows, and in that sense it is closer to discourse analysis than to other forms of analysis. This book provides a systematic empirical study of the broadcast talk in talk shows and maps out the range of formats that appear in the major American and British television shows. The contributors are members of an international network of researchers interested in the study of broadcast talk. Contents: A. Tolson, Introduction: The Talk Show Phenomenon. A. Tolson, Talking About Talk: The Academic Debates. L. Haarman, Performing Talk. H. Wood, "No YOU Rioted! ": The Pursuit of Conflict in the Management of "Lay" and "Expert" Discourses on Kilroy. S. Blum-Kulka, The Many Faces of With Meni : The History and Stories of One Israeli Talk Show. J. Thornborrow. "Has It Ever Happened to You? ": Talk Show Stories as Mediated Performance. R. Brunvatne, A. Tolson, "It Makes It Okay to Cry": Two Types of "Therapy Talk" in TV Talk Shows. I. Hutchby, Confrontation as a Spectacle: The Argumentative Frame of the Ricki Lake Show. G. Myers, "I'm Out of It; You Guys Argue": Making an Issue of It on The Jerry Springer Show.